When I think of fun ideas to do with my grandchildren, this is one of them. They are always so surprised to take 2 ingredients and turn it into something like flavored bread. This recipe is included in the book Southern Living 1,001 Ways to Cook Southern: The Ultimate Treasury of Southern Classics . I was fortunate to find a used copy of it at Amazon for a fair price. It has turned out to be one of my favorite cook books. This recipe is so easy I can’t believe it. 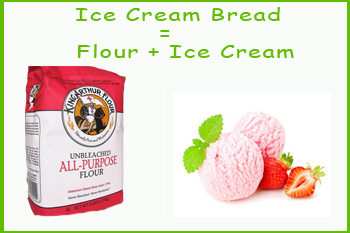 Ice cream only slightly flavors the bread, but the excitement for the kids when it is done is a good feeling. Hope you try it. I will usually make about 2 cups at a time if I am only going to need 1 cup. This is NOT meant to be anything but tasteful, so don’t even try using anything except full fat ice cream! I just made this and I can’t believe it. Its wonderful. I was really skeptical but now its going into my family memory cookbook.